One of the funniest impersonators and look-alikes of this Australian celebrity available as a roaming or roving character, to welcome your guests, drop in for singing telegrams or a surprise alternative MC for your conference dinner entertainment, as well as other private or corporate functions and events. Now, how does this tickle your fancy? 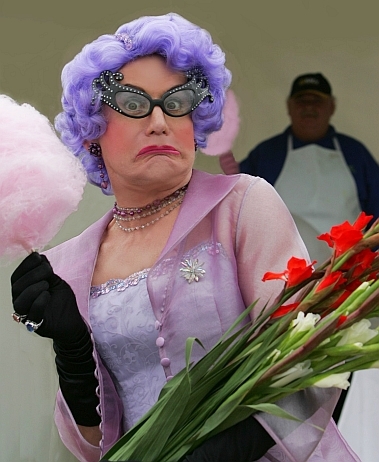 Next time you're planning a function, be it at home, in the office, restaurant or conference venue, wouldn't it be fun to have Dame Edna Everage greet your guests when they arrive? What about if she showed up after dinner and played a few games with your guests or conference delegates to get the party started before the music or main entertainment started? How about a light hearted MC for the evening to cheer everyone up after a solemn day in conference? This talented actor has many years experience in the corporate arena. We've had nothing but great feedback from our clients who've used him before. Jason Thompson is one of those naturally funny personalities who can't help but make you giggle. He is also highly flexible in his performance and can arrange the duration and style of his performance to suit your function needs. Drop us a line with your phone number so we can discuss your requirements and see how he can help. Jason is also available as himself as MC.